2015 has been a coming out party of sorts for Astros pitcher Dallas Keuchel. While he's been on the radar of Houston fans for a couple of years, he's been one of the game's top pitchers in 2015. Dominant might be more appropriate. He parlayed that stellar first half into being named the American League's starting pitcher at the 2015 MLB All-Star Game. That in itself might not make Dallas Keuchel cards, especially his rookie cards hot, it should get them some added attention. The Astros took the lefty in the seventh round of the 2009 draft. It would be three more years before Keuchel made his MLB debut. His first couple of seasons weren't spectacular, but little stood out about the Astros then. Keuchel was one of baseball's most improved players in 2014, which included his first Gold Glove Award. Collectors should have an easy time tracking down all of the Dallas Keuchel rookie cards. There are just three, two of which came in the same product. He also has a couple of prospect cards shortly after being drafted. If you're looking at Dallas Keuchel rookie cards strictly as an investment opportunity, there is an inherent risk that comes with any pitcher. While he's had a couple of good seasons, that doesn't make a career. And even then, only the most dominant pitchers manage to breakthrough into prolonged mainstream hobby success. 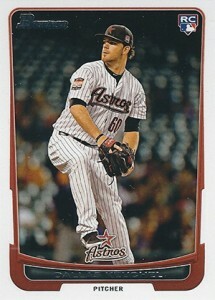 At the same time, it's not like it takes much to delve right into collecting Dallas Keuchel cards. With so few rookies, none of which are particularly limited or come from premium brands, it's affordable to get all of his early base cards. It's a lot less risky than prospecting Bowman Chrome autographs. 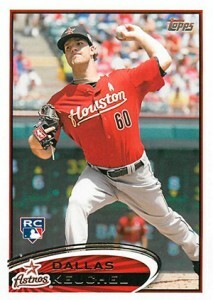 Two-thirds of all Dallas Keuchel rookie cards can be found in 2012 Bowman Draft Picks & Prospects Baseball. The product includes both paper and Chrome versions of the pitcher. While neither are expensive, the basic Bowman card is considered to be the more basic of the two. If its simplicity doesn't appeal, there are several parallels that come with varying rarity. As mentioned, this is the more premium of the two cards from 2012 Bowman Draft but not by a lot. For many collectors, the chromium nature of Bowman Chrome balances affordability and pop. Refractors bring that chase element that might be missing for some. 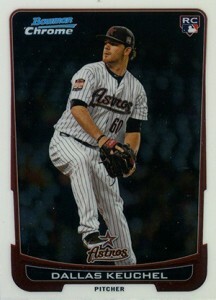 The third and final Dallas Keuchel rookie card is from 2012 Topps Update Series Baseball. Like the two Bowman cards, there's nothing particularly fancy about it. It has several parallel versions, some of which are rare. Others, like the Walmart Blue and Target Red, might be more plentiful but can be trickier to find sometimes due to their exclusive nature. 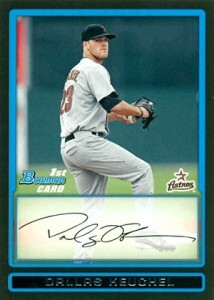 The first Dallas Keuchel cards were released in 2009 Bowman Draft Picks and Prospects Baseball. Part of the Prospect portion of the set, they're not rookies but rather inserts. Still, many collectors treat them like rookie cards. As is customary when Bowman and Bowman Chrome are put together, the paper version brings the lower prices. Dallas Keuchel is something of an anomaly in that he doesn't have a Bowman Chrome Prospect Autograph. His first appearance on a Chrome card is just your basic card. For some collectors, this might be a refreshing change as it means it's affordable no matter your budget. Refractors bring the higher prices for those chasing rainbows or looking for more investment possibilities. 2015 DALLAS KEUCHEL Panini Elite 21st Century #60 Autograph Astros! 2012 Topps Update Dallas Keuchel RC #US188 Mint Houston Astros 4 Card Lot. 2014 Topps Simply Supreme Dallas Keuchel Green SP Auto serial #17 45 Astros Cy ? Dallas Keuchel 2016 Panini Flawless Patch Autograph 01 15 Low Number! !